Could we all have hoped for a better Sunday at the Masters? 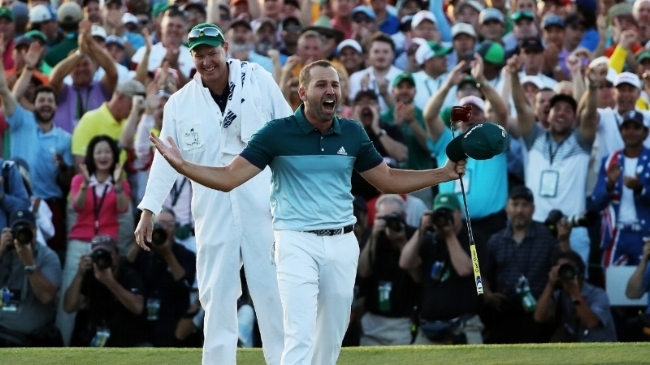 A cinderella story for Sergio Garcia, 37, clinching his very first major in dramatic fashion at Augusta National. Englishman Justin Rose and himself quickly separated themselves from the pack after the outward nine, turning this Sunday into a two-men battle. Although Sergio was shaky at the beginning of the back nine with two consecutive bogeys on 10-11 as well as pulling his drive in trouble on 13, he was able to save par and went on to birdie 14 and eagle 15 to tie Justin. Sergio didn’t look like the Sergio who missed a makeable putt to win the 07’ Open or the one who put a sleeve of balls in the water on 17 at the 13’ Players Championship. No, he looked poised, confident and in control of his emotions coming down the stretch. Even after missing a short birdie putt on 16 to match Rose’s, he kept hitting solid shots forcing Rose to make putts on top of him, which he failed to do on 17, carding a bogey and leaving both players all square heading to the 18th hole. They both hit the fairway and had a short iron into the front-left hole location. Rose got away with a miss when his ball kicked towards the flag, leaving him with a 10 footer for birdie. Sergio hit an amazing iron shot to just about five feet - they both missed and went back to the 18th tee for a playoff. That time, El Niño had two putts to win as he hit almost the exact same approach shot as he did in regulation. He only needed one to close the deal. Garcia’s reaction on 18 was priceless, it showed all the emotion he was keeping and how much he cared. Many think that it shouldn’t have taken this long before he won a Major but we’re all going to agree that it could not have been any more beautiful and dramatic than yesterday’s win was. Both players showed great sportsmanship as well, high-fiving every now and then when they would hit a good shot. This past Sunday wasn’t only fun to watch, it was also great for the game of golf.